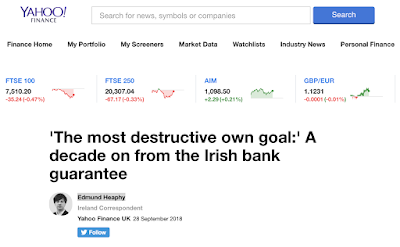 Yahoo Finance's Edmund Heaphy on 10th Anniversary of the Irish Bank Guarantee: https://uk.finance.yahoo.com/news/destructive-goal-decade-irish-bank-guarantee-090447485.html with extensive quotes from myself. 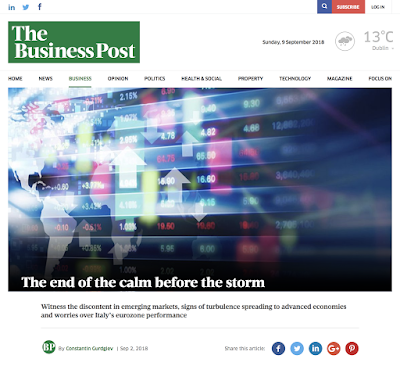 I wrote before both, about the general problem of concentration risk and the specific problem of this risk (more accurately, the concentration-implied VUCA environment) in the specific asset classes and the economy. Here is another reminder of how the build up of concentration risks in the financial markets is contaminating all asset classes, including the off-the-wall crypto currencies: https://thenextweb.com/hardfork/2018/09/18/cryptocurrency-bitcoin-blockchain-wallet/. The added feature of this concentration risk is extreme (87%) illiquidity of major Bitcoin holdings. 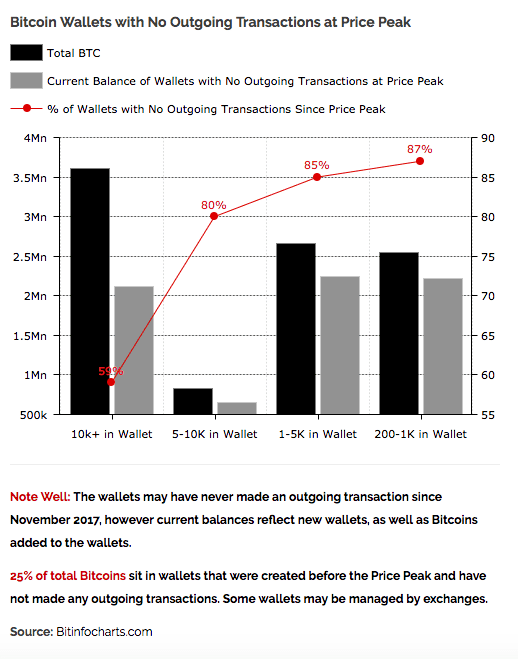 This means that under the common 'Mine and Hold' strategy, already monopolized, highly concentrated mining pools literally create a massive risk buildup in the Bitcoin trading systems: with 87% of wallets not trading for months, we have a system of asset pricing and transactions that effectively provides zero price discovery and will not be able to handle any spike in supply, should these accounts start selling. Worse, the system is tightly coupled, as Bitcoin holdings are frequently used to capitalize other leveraged crypto currencies undertakings, such as investment funds and ICOs. The extent of latent instability in the crypto markets is currently equivalent to a Chernobyl reactor on the cusp of the human error. A recent post from the U.S. Fed looked at how companies with large holdings of cash abroad have used those funds following the Tax Cuts and Jobs Act of 2017 (the TCJA, or the Republican Tax Cuts), which incentivised the repatriation of foreign earnings stashed by the U.S. corporations abroad, including Ireland. Per Fed note: "by the end of 2017, U.S. MNEs had accumulated approximately $1 trillion in cash abroad, held mostly in U.S. fixed-income securities", aka - bonds. 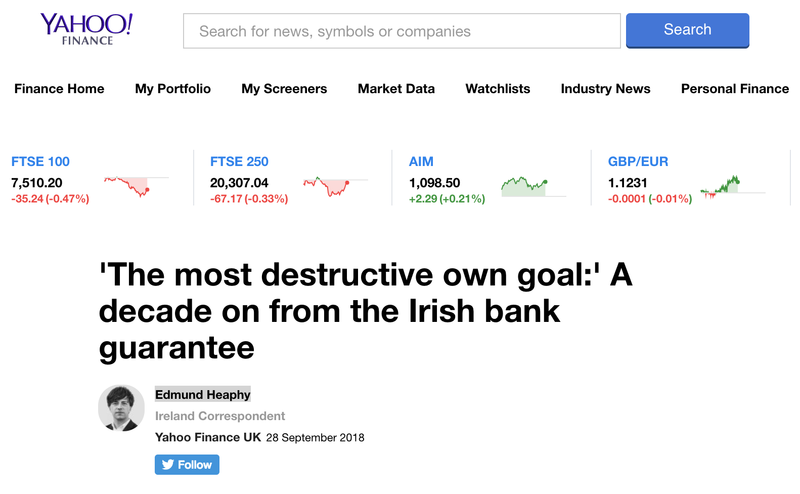 Which, of course, also explains why Ireland is one of the largest domiciles for U.S. Treasuries. The TCJA moved the U.S. "to a quasi-territorial tax system in which profits are taxed only where they are earned" so "...U.S. MNEs' foreign profits will therefore no longer be subject to U.S. taxes when repatriated. As a transition to this new tax system, the TCJA imposed a one-time tax (payable over eight years) on the existing stock of offshore holdings regardless of whether the funds are repatriated, thus eliminating the tax incentive to keep cash abroad." As of Q1 2018, the U.S. firms "repatriated just over $300 billion, roughly 30% of the estimated stock of offshore cash holdings." This "quantity of cash repatriated since the passage of the TCJA might have a notable effect on firm financing patterns and investment decisions in the near term". 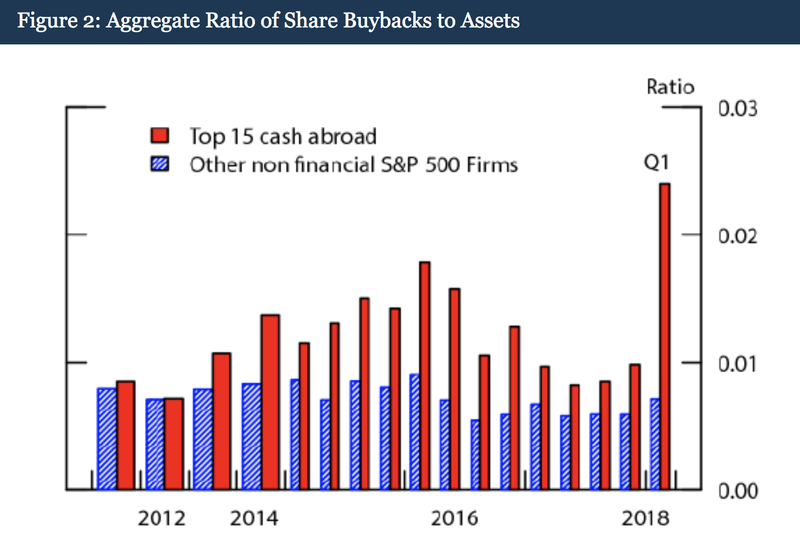 The Fed note argues "that funds repatriated in 2018:Q1 have been associated with a dramatic increase in share buybacks; evidence of an increase in investment is less clear at this stage, as it is likely too early to detect given that the effects may take time to materialize." The top 15 U.S. firms (by cash holdings abroad) "account for roughly 80 percent of total offshore cash holdings, and roughly 80 percent of their total cash (domestic plus foreign) is held abroad... following the passage of the TCJA ...share buybacks spiked dramatically for the top 15 cash holders, with the ratio of buybacks to assets more than doubling in 2018:Q1. In dollar terms, buybacks increased from $23 billion in 2017:Q4 to $55 billion in 2018:Q1." 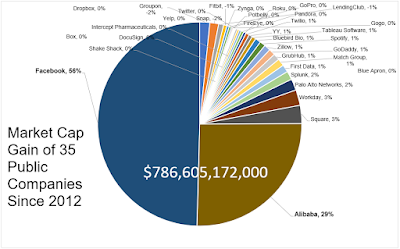 Worse: "among the top 15 cash holders, the largest holders accounted for the bulk of the share repurchases: In 2018:Q1, the top 5 cash holders accounted for 66 percent, and the top holder alone accounted for 41 percent." Note: the top holder is... Apple. 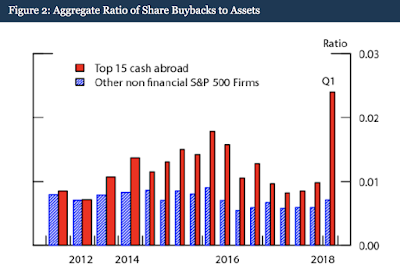 Of course, "firms can also pay out cash to shareholders through dividends; however, unlike buybacks, dividends were little changed for the top 15 cash holders relative to the same period last year." "...unlike in the case of share buybacks, there is no obvious spike in investment among the top 15 cash holders in 2018:Q1 relative to the previous quarter. Indeed, it appears that the top 15 cash holders have already been on a slight upward trajectory relative to other firms for a few years." The repatriation "may also have been used to pay down debt; however, the aggregate debt of the top 15 cash holders declined only about $15 billion, or 2 percent of their total debt outstanding, suggesting limited paydowns so far." Thus, in simple terms, and allowing some conditionality for lags in investment, the TCJA 2017 has primarily went to stimulate stock market activity, as opposed to either corporate deleveraging or corporate investment. This is consistent with 2004 repatriation amnesty, when the bulk of funds brought by the U.S. MNEs back to the U.S. went to fund shares repurchases in 2005. It's back to the future folks. One of my favourite long-run tail risks to watch in the financial markets (and indeed, due to ongoing monopolisation trends, in the entire economy) is concentration risk. Here is an absolutely epic post from @michaelbatnick on the subject of increasing concentration in equity markets driven by the growing trend toward keeping new tech mega starts private: http://theirrelevantinvestor.com/2018/09/10/making-private-public/. 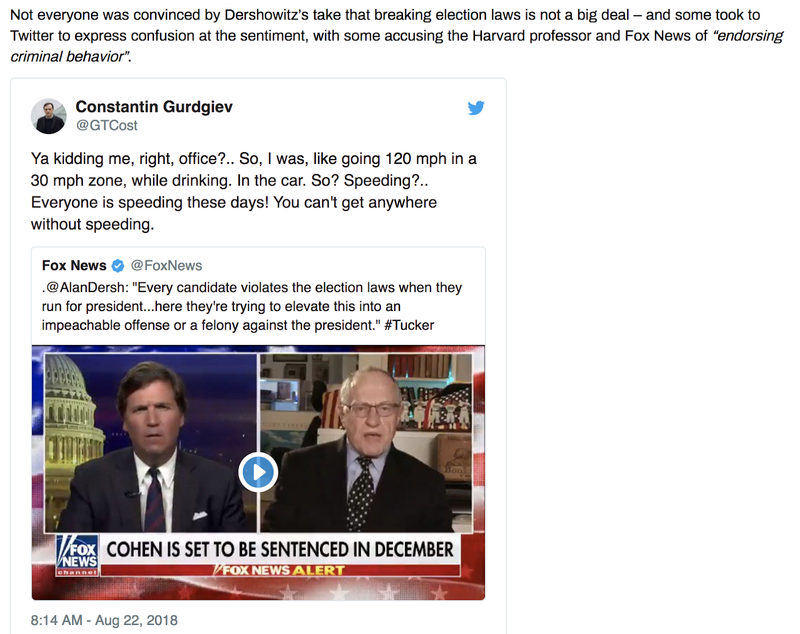 Aside from compiling a treasure trove of data, the post brings to light some interesting observations, not necessarily central to the author's core arguments. The post correctly views this as evidence that both volumes and numbers of IPOs have been relatively steady over the recent years. Albeit, both are running woefully below the pre-dot.com bust era averages. 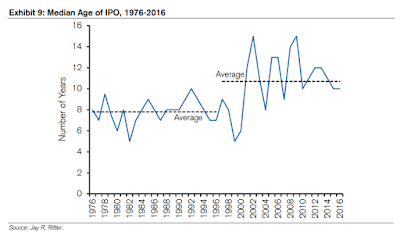 And, as other evidence presented shows, this is not the feature of the dot.com bubble build up phase: in fact, numbers of IPOs have been running well below the 1980-2000 average since the dot.com bust. Which, of course, supports higher median IPO size in the chart above. 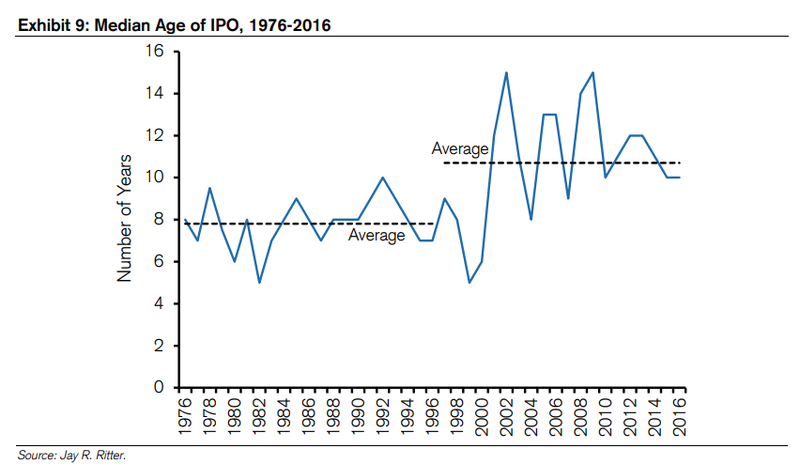 Controlling for this, the collapse in IPOs activity in 2001-2018 period is probably much more dramatic, than the first chart above indicates. Or, put differently, IPOs are now more concentrated in the space of older, and hence more able to raise funds, companies. That is a phenomenon consistent with concentration risk rising. 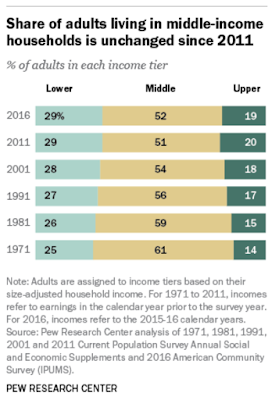 It is also a phenomenon consistent with the hypothesis that entrepreneurialism is declining in the U.S. as younger, more entrepreneurial ventures are clearly less capable of accessing public equity markets today than in pre-2001 period. Yes, the markets are dominated by a handful of stocks when it comes to providing returns. Namely, Facebook and Alibaba account for a whooping 85% of the total market cap gains since 2012. $85 of each $100 in market cap increases went to just these two companies. This is concentration risk at work. 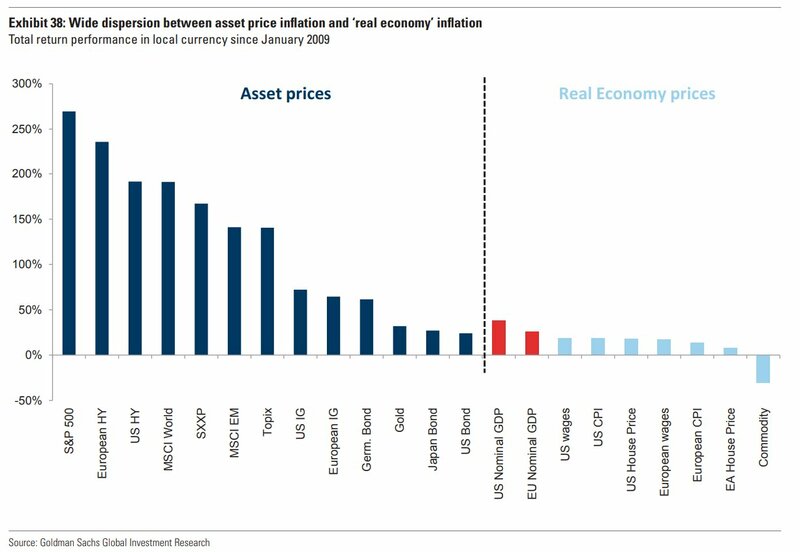 Even tightly thematic investment strategies, e.g. ESG risk hedging investments, cannot avoid crowding into a handful of shares. Any tech sector blowout is going to be systemic, folks. The twin secular stagnations hypothesis (TSSH, first postulated on this blog) that combines supply-side (technological cyclicality) and demand-side (demographic cyclicality) arguments for why the world economy may have settled on a lower growth trajectory than the one prevailing before 2007 has been a recurrent feature of a number of my posts on this blog, and has entered several of my policy and academic research papers. Throughout my usual discourse on the subject, I have persistently argued that the TSSH accommodates the view that the Global Financial Crisis and the associated Great Recession and the Euro Area Sovereign Crisis of 2007-2014 have significantly accelerated the onset of the TSSH. In other words, TSSH is not a displacement of the arguments that attribute current economic dynamics (slow productivity growth, slower growth in the real economy, reallocation of returns from labour and human capital to technological capital and, more significantly, the financial capital) to the aftermath of the structural crises we experienced in the recent past. The two sets of arguments are, in my view, somewhat complementary. From this later point of view, a research paper, "Slow Recoveries & Unemployment Traps: Monetary Policy in a Time of Hysteresis" by Sushant Acharya, Julien Bengui, Keshav Dogra, and Shu Lin Wee (August 2018 https://sushantacharya.github.io/sushantacharya.github.io/pdfs/hysteresis.pdf) offers an interesting read. The paper starts with the - relatively common in the literature - superficial (in my opinion) dichotomy between the secular stagnation hypothesis and the "alternative explanation" of the slowdown in the economy, namely "that large, temporary downturns can themselves permanently damage an economy’s productive capacity." The latter is the so-called 'hysteresis hypothesis', "according to which changes in current aggregate demand can have a significant effect on future aggregate supply" which dates back to the 1980s. The superficiality of this dichotomy relates to the causal chains involved, and to the impact of the two hypotheses. However, as the authors note, correctly: "While the two sets of explanations may be observationally similar, they have very different normative implications. If exogenous structural factors drive slow growth, countercyclical policy may be unable to resist or reverse this trend. In contrast, if temporary downturns themselves lead to persistently or permanently slower growth, then countercyclical policy, by limiting the severity of downturns, may have a role to play to avert such adverse developments." The authors develop a model in which countercyclical monetary policy can "moderate" the impact of the sudden, but temporary large downturns, i.e. in the presence of hysteresis. How does this work? The authors first describe the source of the deep adverse shock capable of shifting the economy toward long-term lower growth rates: "in our model, hysteresis can arise because workers lose human capital whilst unemployed and unskilled workers are costly to retrain". This is not new and goes back to the 1990s work on hysteresis. 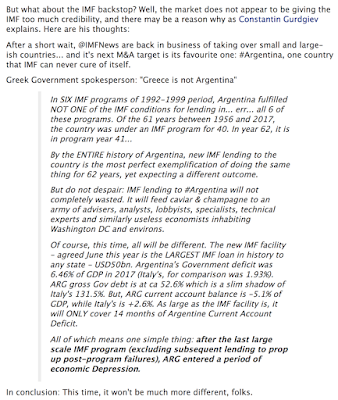 The problem is explaining why exactly such deep depreciation takes place. Long unemployment spells do reduce human capital stock for workers, but long unemployment spells are feature of less skilled workforce, so there is less human capital to depreciate there in the first place. Retraining low skilled workers is not more expensive than retraining higher skilled workers. In fact, low skilled workers seek low skilled jobs and these require only basic training. It is quite possible that low skilled workers losing their jobs today are of certain demographic (e.g. older workers) that reduces the effectiveness of retraining programs, but that is the TSSH domain, not the hysteresis domain. One thing that does help this paper's hypothesis is the historical trend of growing duration of unemployment, e.g. discussed here: http://trueeconomics.blogspot.com/2017/07/27717-us-labor-markets-are-not-in-rude.html and the associated trend of low labour force participation rates, e.g. 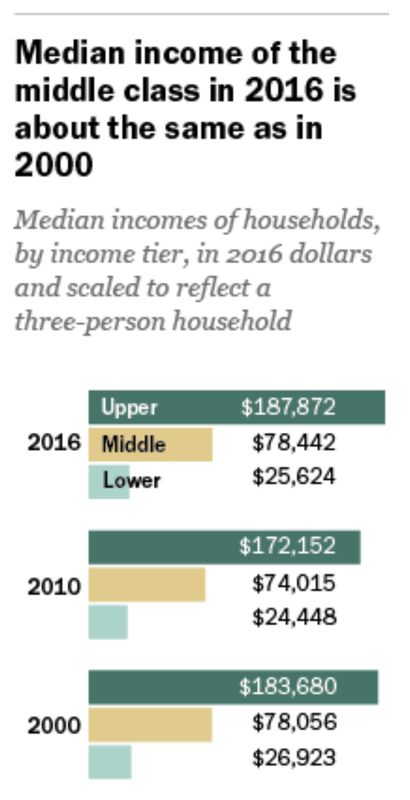 discussed here: http://trueeconomics.blogspot.com/2018/06/8618-human-capital-twin-secular.html. 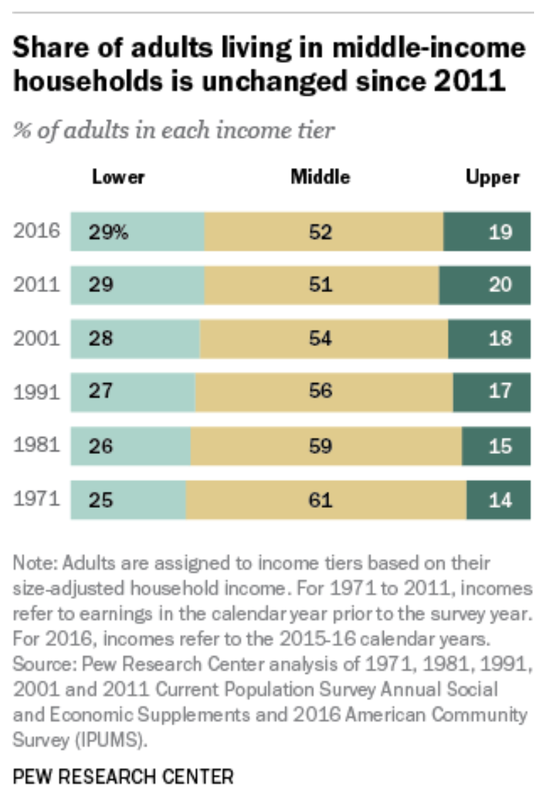 I do agree that unskilled workers are costly to retrain, especially in the presence of demographic constraints (which are consistent with the secular stagnation on the demand side). But, back to the authors: "... large adverse fundamental shocks can cause recessions whose legacy is persistent or permanent unemployment... Accommodative policy early in a recession can prevent hysteresis from taking root and enable swift a recovery. In contrast, delayed monetary policy interventions may be powerless to bring the economy back to full employment." "As in Pissarides (1992), these features [of long unemployment-induced loss of human capital, sticky wages that prevent wages from falling significantly during the downturns, costly search for new jobs, and costly retraining of workers] generate multiple steady states. One steady state is a high pressure economy: job finding rates are high, unemployment is low and job-seekers are highly skilled. 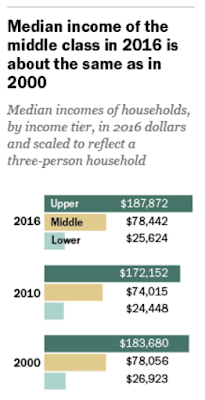 While tight labor markets - by improving workers’ outside options - cause wages to be high, firms still find job creation attractive, as higher wages are offset by low average training costs when job-seekers are mostly highly skilled." Note: the same holds when highly skilled workers labour productivity rises to outpace sticky wages, so one needs to also account for the reasons why labour productivity slacks or does not keep up with wages growth during the downturn, especially when the downturn results in selective layoffs of workers who are less productive ahead of those more productive. Hysteresis hypothesis alone is not enough to do that. We need fundamental reasons for structural changes in labour productivity that go beyond simple depreciation of human capital (or, put differently, we need something similar to the TSSH). "The economy, however, can also be trapped in a low pressure steady state. In this steady state, job finding rates are low, unemployment is high, and many job-seekers are unskilled as long unemployment spells have eroded their human capital. Slack labor markets lower the outside options of workers and drive wages down, but hiring is still limited as firms find it costly to retrain these workers." Once again, I am not entirely convinced we are facing higher costs of retraining low skilled workers (as argued above), and I am not entirely convinced we are seeing the problem arising amongst the low skilled workers to begin with. Post-2008 recovery has been associated with more jobs creation in lower skilled categories of jobs, e.g. hospitality sector, restaurants, bars, other basic services. These are low skilled jobs which require minimal training. And, yet, we are seeing continued trend toward lower labour force participation rates. Something is missing in the argument that hysteresis is triggered by cost of retraining workers. negative consequences. 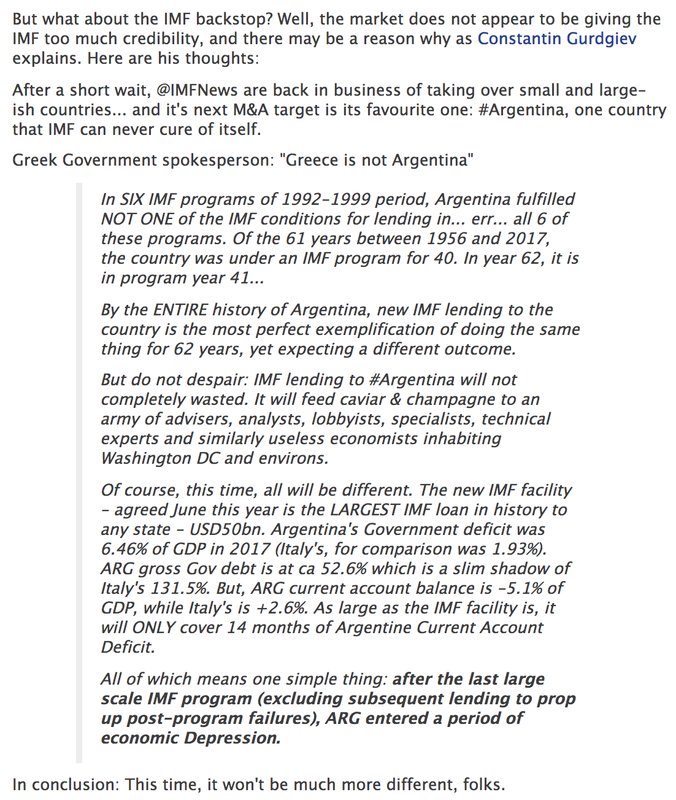 Monetary policy, however, is only effective if it is implemented early in the downturn, before the recession has left substantial scars... [otherwise] ...fiscal policy, in the form of hiring or training subsidies, is necessary to engineer a swift recovery." The paper tests the model in the empirical setting. And the results seem to be plausible: "allowing for a realistic degree of skill depreciation and training costs... is sufficient to generate multiple steady states.... this multiplicity is essential in explaining why the unemployment rate in the U.S. took 7 years to return to its pre-crisis level. In contrast, the standard search model without skill depreciation and/or training costs predicts that the U.S. economy should have fully recovered by 2011. ...the model indicates that had monetary policy been less accommodative or timely during the crisis, leading to a peak unemployment rate higher than 11 percent, the economy might have been permanently scarred and stuck in an unemployment trap. Furthermore, our model suggests that the persistently high proportion of long-term unemployed in the European periphery countries may reflect a lack of timely monetary accommodation by the European Central Bank." Fraction of Long-term unemployed (>27 weeks) in select countries. The figure plots five quarter moving averages of quarterly data. The dashed-line indicates the timing of Draghi’s “whatever it takes” speech. This seems quite plausible, even though it does not explain why eventual 'retraining' of low skilled workers is still not triggering substantial increases in labour productivity growth rates in Europe and the U.S.
One interesting extension presented in the paper is that of segmented labour markets, or the markets where "employers might be able to discern whether a worker requires training or not based on observable characteristics - in particular, their duration of unemployment... [so that, if] skilled and unskilled workers searched in separate markets, the economy would still be characterized by hysteresis, but it would take a different form. There are two possibilities to consider. [If] ... the firm’s share of the surplus from hiring an unskilled worker, net of training costs, is large enough to compensate firms for posting vacancies in the unskilled labor market, ...after a temporary recession which increases the fraction of unskilled job-seekers, it can take a long time for these workers to be reabsorbed into employment. Firms prefer to post vacancies in the market for skilled job-seekers rather than the market for unskilled job-seekers in order to avoid paying a training cost. With fewer vacancies posted for them, unskilled job-seekers face a lower job-finding rate and thus, the outflow from the pool of unskilled job-seekers is low. In contrast, the skilled unemployment rate recovers rapidly - in fact, faster than in the baseline model with a single labor market... [Alternatively], the segmented labor markets economy could experience permanent stagnation, rather than a slow recovery, [if] unskilled workers are unemployable, since firms are unwilling to pay the cost of hiring and training these workers. Thus unskilled workers effectively drop out of the labor force." We do observe some of the elements of both such regimes in the advanced economies today, with simultaneous increasing jobs creation drift toward lower-skilled, slack in supply of skills as younger, educated workers are forced to compete for lower skilled jobs, and a dropout rate acceleration for labour force participation. Which suggests that demographics (the TSSH component, not hysteresis component) is at play at least in part in the equation. In summary, a very interesting paper that, in my opinion, adds to the TSSH arguments a new dimensions: deterioration in skills due to severity of a demand shock and productivity shock. It does not, however, contradict the TSSH and does not invalidate the key arguments of the TSSH. As per effectiveness of monetary or monetary-fiscal policies in combatting the long-term nature of the adverse economic equilibrium, the book remains open in my opinion, even under the hysteresis hypothesis: if hysteresis is accompanied by a permanent loss of skills twinned with a loss of productivity (e.g. due to technological progress), adverse demographics (older age cohorts of workers losing their jobs) will not be resolved by a training push. You simply cannot attain a catch up for the displaced workers using training schemes in the presence of younger generation of workers competing for the scarce jobs in a hysteresis environment. 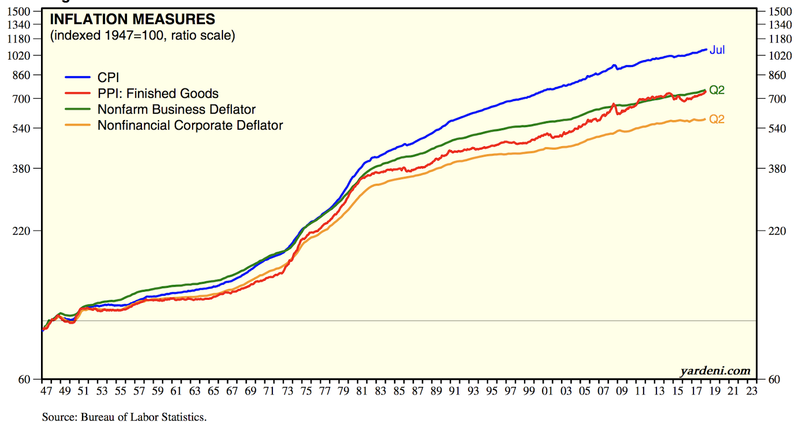 And the Zero-Lower Bound on monetary policy still matters: the duration of the hysteresis shock will undoubtedly create large scale mismatch between the sovereign capacity to fund future liabilities (deficits) and the longer-run inflationary dynamics implied by the extremely aggressive and prolonged monetary intervention. 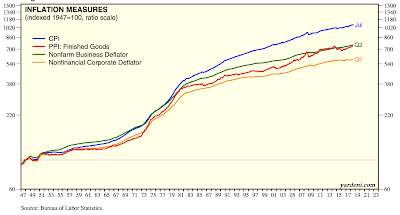 In other words, large enough hysteresis shock will require Japanification of the economy, and as we have seen in the case of Japan, such a scenario does not lead to the economy escaping the TSSH or hysteresis (or both) trap even after two decades of aggressive monetary and fiscal stimuli. In an important discussion, titled "Tax-exempt lobbying: Corporate philanthropy as a tool for political influence", Marianne Bertrand, Matilde Bombardini, Raymond Fisman, and Francesco Trebbi (02 September 2018, https://voxeu.org/article/corporate-philanthropy-tool-political-influence) argue that as "special interests use donations to influence the political process", "...philanthropic efforts in the US are targeted, at least in part, to influence legislators. Districts with influential politicians receive more donations, as do non-profits with politicians on their boards. This is problematic because, unlike PAC contributions and lobbying, influence by charity is hard for the public to observe." The resulting conclusion by the authors is that the case of corporate-charity interlinks "amounts to a taxpayer subsidy of corporations expressing their political voice". In other words, concentration of market power causes concentration push in lobbying and, thus, potentially forces policy formation to more closely reflect the interests of the corporate donors at the expense of the taxpayers and ordinary voters. 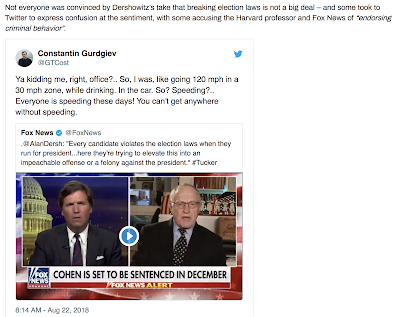 This is a very important issue in any analysis of the functioning of our democratic processes. But it also raises another 'adjoining' issue, not covered in the paper: American corporations are increasingly relying on other channels to alter social (and related policy) outcomes today. This channel is the companies increasing financial and other commitments to Corporate Social Responsibility and Social Impact (or even broader ESG) targeting. Whilst benign in its core values and ethos, the channel can be open to potential abuse by corporate powers. In addition, like charity status channel, the CSR and SI/ESG channel also avails of public funding link ups to corporate balance sheets (via tax incentives, subsidies, co-financing of projects, etc). The question worth asking, therefore, is the following one: To what extent do modern SI/ESG and CSR strategies of major corporations align with their lobbying objectives? In other words, do corporates use SI/ESG/CSR strategies to promote self-interest beyond purely societal interest? Surprisingly, very little research in the Social Impact or ESG analysis has been devoted to the potential for corporations to 'game the system' in their favour. And post-QE squeeze (higher interest rates and higher cost of credit intermediation) is coming for the already stretched households. Any wonder that political populism/opportunism is also on the rise? 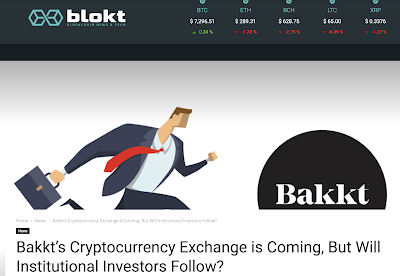 3/9/18: Bakkt: One New Exchange, Two Old Exchanges, Same Crypto Story?